We love PAC-MAN. You love PAC-MAN. Congressman Erik Paulsen loves PAC…money. It’s no secret that Paulsen has a strong affinity for the special interests who fund his campaigns. In fact, over the course of his career, Congressman Paulsen has gobbled up $8.1 million from PACs. 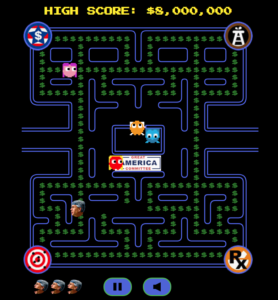 An ECU volunteer created this fun spoof, Erik the PAC MAN to spotlight Paulsen’s endless appetite for special interest money — and to see if you can beat his high score. Paulsen is a leading recipient of contributions from PACs of all members of Congress, having received the 7th-most PAC dollars so far this election cycle. Paulsen also received the 8th most in the 2016 election cycle. While Paulsen hasn’t seen a PAC check he hasn’t liked, his opponent, Dean Phillips, is rejecting all PAC money in his campaign. Phillips is also challenging Paulsen to take the “Minnesota Way” pledge to ensure a clean, fair race. The pledge is aimed at getting Big Money out of the district and putting people ahead of special interests. Determined to defend and maintain the rigged system, Paulsen has not accepted the pledge. In December, ECU named Congressman Erik Paulsen to its Big Money 20, a list of the group’s top targets for defeat because they put the interests of donors ahead of their constituents.